If you think that Bicycle is the magician's deck, think twice, because it is official now: The Phoenix Deck is the only FISM recognized playing card deck worldwide. 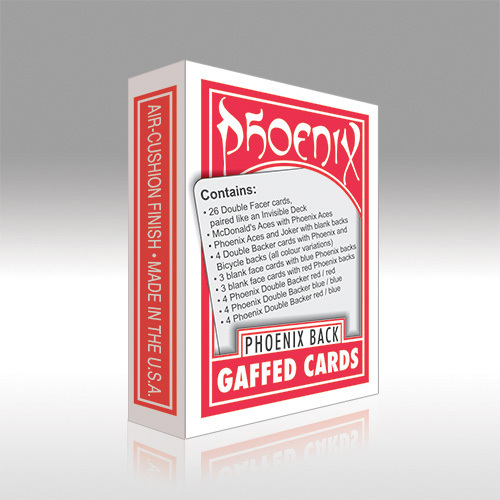 To celebrate the partnership with FILM, it was release the Phoenix Gaffed Deck. It is a deck that does not contain a single fancy misprinted card, but has all that a serious card worker needs: 26 Double-Faced cards, that finally make sense. The prints are paired like an Invisible Deck, so 26 cards can cover all values in a deck, with half the thickness. Large Phoenix Aces and Phoenix Joker with blank backs. Using these cards in a blank back Bicycle Deck makes it automatically into a blank backed Phoenix Deck. McDonald's Aces with the large Phoenix Aces makes the effect most visible for your audience. 4 Double Backer cards with Phoenix backs on one side and Bicycle backs on the other! All combinations included (red/red, blue/blue, red/blue, blue/red). 3 blank face cards with blue Phoenix backs. 3 blank face cards with red Phoenix backs. 4 Phoenix Double Backer red/red. 4 Phoenix Double Backer blue/blue. 4 Phoenix Double Backer red/blue. • The cards are poker size. Αυτό το προϊόν προστέθηκε στον κατάλογό μας την Thursday 14 June, 2018. Ο χρόνος που χρειαζόμαστε για την έναρξη της αποστολής των προϊόντων μας ορίζεται από 48 έως 96 ώρες (εκτός ωρών Σαββατοκύριακου).